Oh look! Another story on something 3D! Who would have guessed!? Yes, that's right, yet another story on a 3D product. You better get used to it though because 3D isn't going anywhere anytime soon. The newest 3D product talked about today is a new 3D capable DLP projector from home theater giant Sharp. Now everybody knows that Sharp has been on a huge 3D push in recent months, and the final piece of their 3D puzzle is their new 3D-capable DLP projector. The device, known as the XV-Z17000 (can't they ever come up with a simple name? ), is the very first 3D projector from Sharp that has been exclusively designed for the consumer market. Even though this is Sharp's first attempt at a 3D projector, the spec sheet makes the outlook seem pretty good. The XV-Z17000 leverages DLP technology alongside a 250-watt lamp to deliver impressive color accuracy as well as enough power to pump out 1600 lumens in high brightness mode. The XV-Z17000 comes with a native contrast ratio of 30,000 to 1 which isn't the most outstanding ratio on the market, but it definitely isn't the worst. One particularly nice feature of the XV-Z17000 is its ultra-quiet fan which produces a mere 23 decibels of noise output when the projector is running with Eco+Quiet mode enabled. What this means is that you will be hearing less noise from the built-in fan and much more clearer audio from your speakers. A release date and official pricing for Sharp's XV-Z17000 has yet to be determined, but you can probably expect to see the device on store shelves at the beginning of next year. Couple this together with the list of Sharp's other 3D devices, and you will soon be living the movies as opposed to just watching them. 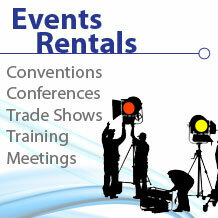 In the market for an AV Rental? Rentacomputer.com has a wide range of AV rentals delivered nationwide. Call today at 800-736-8772.